Kaija Saariaho has been a frequent visitor to the USA in recent years, and her music has been widely performed in various concert series and at festivals there. The premiere of a new production of her first opera, L’amour de loin, at the Metropolitan Opera in December 2016 will be an operatic event such as has not been seen for decades, and it will be broadcast to cinemas around the world. Not only that, but she is also working on a new opera. It is often said that America teaches European composers how to be lighter, more positive and more relaxed. Fortunately, this has not applied to Kaija Saariaho, who has kept a firm hand on her original idiom despite expanding her horizons to the USA. The themes that she tackled in her youthful works – love, death, nature and the mystery of life – remain the same. Along the way, the key element in her music, tonal colour, has acquired even more meaning: luminous is all the more luminous, and dark is darker than ever. Among the sounds she has added to her palette are the countertenor voice and the kantele, which she has included in her latest opera, Only the Sound Remains (for more, see the FMQ web article Sounds of shadow and light). What is interesting is that this fundamentally Finnish instrument seems to have settled permanently into her toolkit. “I had been thinking about the kantele for a long time, maybe 20 years, but I had not had a suitable project in which to use it. It is an excellent fit for Only the Sound Remains, not only because of its kinship with the koto but also because of its elegant sounds. There’s a lot of material for kantele and flute in the opera; this is such a lovely combination that I felt like revisiting that material,” the composer says. “Just now I’m writing a small piece for kantele and flute to be premiered at the Présences festival of the French Radio in February 2017. I’m the featured composer at the festival,” says Saariaho. Only the Sound Remains was mostly written in New York. “I’ve been to the USA several times in recent years, and no doubt that has affected my work. New York seemed like a particularly suitable place to write this opera, since the libretto is in English,” she says. 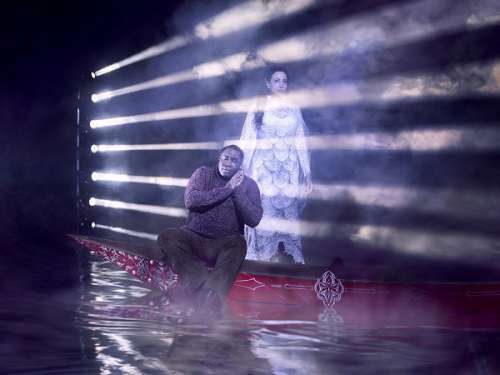 Eric Owens as Jaufré Rudel and Susanna Phillips as Clémence in Kaija Saariaho’s L’Amour de loin. Saariaho’s music will be frequently performed in New York this autumn, and her first opera, L’amour de loin (2000), the most frequently performed contemporary opera in the world, will finally be premiered at the Metropolitan Opera in New York in December 2016. This is a remarkable achievement, as the Met is known for its ultra-conservative programming that shuns contemporary repertoire. Moreover, it is not known for performing works written by women. There was a minor uproar when it emerged that an opera written by a woman had last been staged at the Met more than a century ago. Saariaho is happy that L’amour de loin has finally made it to the Met, as the project has been more than ten years in the planning. “I no longer think of this as a career move, because it has been on the cards for so long. I’m more interested about how my music will sound in that fine auditorium where I’ve had so many great experiences. I’m also happy that the production is beautiful and suits the music. L’amour de loin has been produced a dozen times, with very different approaches,” she says. Audiences around the world will no doubt be happy to know that L’amour de loin will be screened as a Met broadcast in cinemas. The New York Philharmonic will also be focusing on Saariaho this autumn. The orchestra’s composer-in-residence Esa-Pekka Salonen will be conducting three of her orchestral works: the clarinet concerto D’OM LE VRAI SENS (2010), Circle Map (2012) for large orchestra and Lumière et Pesanteur (2009), which is an arrangement of the eighth movement of La Passion de Simone and a gift for Salonen. Also on the programme is Lonh (1996) for soprano and electronics, a sibling work to L’amour de loin. The visual design of the concerts is by director Pierre Audi, who invited the composer’s husband Jean-Baptiste Barrière to create videos for them. La Passion de Simone will also be performed in New York by the American ensemble ICE and La Chambre aux Echos from France in November. In June 2016 Saariaho was the headline guest composer at the Ojai Festival, held in the lap of nature in central California. The festival featured a cross-section of Saariaho’s chamber music, but surprisingly Only the Sound Remains remained, well, unsounded. “Without having seen the recent world premiere, the organisers had no idea how sensitive the work is and how delicate the instruments, particularly the kanteles. According to Japanese tradition, the performances should have taken place in the forest in the morning and in the evening, but the mountain climate proved to be too much of a challenge. It was a huge disappointment for everyone, of course. Fortunately there were other important works of mine on the programme, particularly the chamber orchestra version of La Passion de Simone,” she says. Saariaho’s next major project is an opera to a libretto by the celebrated Finnish author Sofi Oksanen, known for her powerful novels. A woman librettist is even rarer than a woman composer. “I asked Sofi to join this project, because apart from being a fine author she is also someone who is keenly in touch with her times and responds wisely. Perhaps I approached her because I wanted to get to know her and her thinking better! Selecting her was not so much a feminist thing, and the opera is not about that in particular. I consider people as people, not through their gender, and I hope my music will be received in similar fashion,” she says. She is also concerned about the eroding of the cultural content of our lives, since that will affect future generations too. “I have tended to avoid speaking publicly about anything other than music, but the way things are going, one does not have to be a specialist to realise how productising everything, obsessive branding and spreadsheets are driving cultural content out of our lives. This will have a direct impact on the plurality of culture and on the education of future generations,” says Saariaho. The principal commissioning party for Saariaho’s new opera is the Royal Opera House at Covent Garden in London. The premiere is pencilled in for 2020. “The director is still being discussed, the conductor has been agreed on and will probably be announced later. I love planning a premiere in London, but there are a few years of hard work between now and then. I’m somewhat familiar with the ROH, since choreographer Wayne McGregor created a dance work entitled Limen based on my cello concerto Notes on Light a few years ago. The libretto for the new opera is all but completed, and the responsibility for taking the project further now rests with me. I’ll spend most of the autumn in New York, and there will be so much going on with my music in addition to L’amour de loin that I cannot imagine writing a grand opera there. So I’ll be beginning the actual work towards the end of the year, although I’ve already been sketching out some material,” says Saariaho. Watch here a preview of Robert Lepage’s Met premiere production of Kaija Saariaho’s L’Amour de loin, starring Susanna Phillips and Eric Owens and conducted by Susanna Mälkki. See Mälkki’s new FMQ interview here. Kaija Saariaho received BBVA Foundation’s Frontiers of Knowledge Award in 2018. More information about it here.